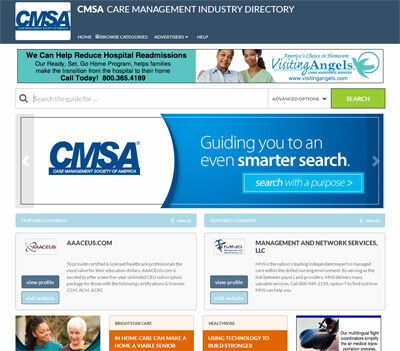 The Case Management Society of America (CMSA) is pleased to announce that it has launched its Care Management Industry Directory, an online vendor search specifically designed for the care management industry. The directory is easily accessible at the Care Management Industry Directory website. The directory will enable you to conveniently perform targeted searches for the industry products and services needed to keep your business running — without the unrelated clutter of a general Internet search engine. Users have the option of performing keyword-driven searches or a category-specific search. Both methods produce the most industry relevant results on the Web, saving you valuable time and money. Additionally, the guide includes a Product Showcase section that provides one of the best ways to learn about both new products in the industry and fantastic promotions. Take advantage of the services provided by the Care Management Industry Directory to maintain relationships established at the Annual Conference & Expo and assist in your purchasing decisions all year.